Microsoft XP Updates are an essential part of computer security. Without them, your machine is vulnerable to the millions of active Computer Viruses and Malware. 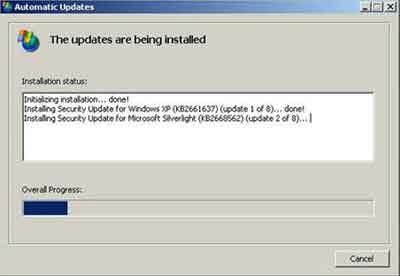 Part 1 provides need to know information such as What are Windows XP Security Updates? And What types of patches does Microsoft issue? This is essentially a description of the bigger picture with regards to Microsoft Windows XP Updates which I think ALL home computers users should know! There are Home Computer Users who remain XP Service Pack 2 or earlier. Therefore they are NOT receiving any more Security patches. Are you one? Do you actively NOT apply Windows Updates? What problems, if any, has this caused you? Write your own web page by completing the Do You NOT Apply Windows Updates? Form at the bottom of this page. Share your experiences, thoughts and opinions with everyone! You can also read other Site Visitors Experiences with Windows XP updates. 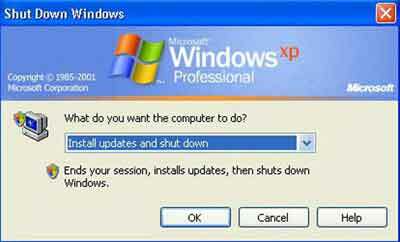 Windows XP regularly checks for new patches released by Microsoft. Depending how your computer is setup, the yellow update shield appears in your System Tray to tell you new patches are available. If you have Automatic Updates setup differently, or you want to keep an eye on how the update installation process is progressing, double click the highlighted Windows Update shield, as shown above. Ensure Express Install (Recommended) is selected and click OK. This immediately starts the installation of your computers new patches. If you want to pick and choose which patches you install, select the Custom Install (Advanced) option. How Do you Want To Install Updates? If you decided to select the Custom Install option, you are presented with a list of updates to be applied, and the choice of which updates NOT to install. For example, if there were any Windows XP Device Drivers listed, I would personally untick them so they would not be installed. This is because I think device drivers issued by the manufacturers are much better than the cut down ones issues by Microsoft. I have experienced lots of issues with device drivers issued by Microsoft, and I am keen for you not to experience these issues either. Therefore, I strongly advise you not to install devices drivers issued by Microsoft. As you see from the images below, Microsoft tend to issue a mix of Security Updates, Critical Updates and Definition Updates for products such as the Microsoft Malware Removal Tool. When Microsoft XP Updates are installing, you can continue working without interruption. The message below appears. However, if you own an older computer, you may find things slow down a little when certain patches are released. Be patient and let them complete. If you click the Installing Updates... Speech bubble you can watch the updates installing. This is handy if you want to see which updates are failing to install. Microsoft XP Updates can take a variable amount of time to install, depending on the number of patches, types and sizes. For example, if you are installing larger patches, such as the Windows XP SP3 download it could take anywhere up to an hour for the install process to complete. 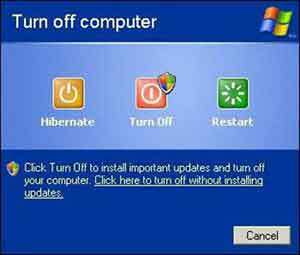 Once the installation process in complete, you have the choice to either Restart Now or simply Close the Automatic Updates window. I advise to select the Restart Now option ASAP. This way your computer is made more secure more quickly. If you decide to simply Close the Installation Complete screen, the message below randomly appears reminding you that your computer needs to be restarted to complete the installation process. You may choose this option if you are in the middle of something and you want to complete it first. The message below appears on your screen from time to time to remind you that your computers needs to be restarted to complete the installation process. I find this screen becomes annoying. Take a moment to restart your computer. When your computer restarts, you see a message in your System Tray conforming the update process has completed successfully. It is also worth noting that if you do not trigger the update process, you are given the option to install any available updates on shutdown. One of the following images appear. If you haven't applied patches during your Windows session, I strongly advise you install them now. The next section looks at the types of things you can do to ensure patches have not triggered any problems. 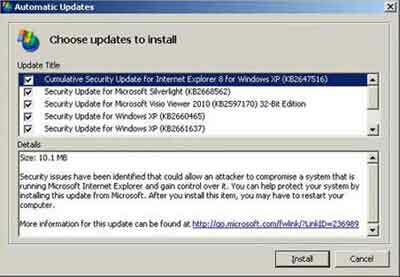 Complete some or all of the following to ensure Microsoft XP Updates do not destabalise your computer. Test Your Applications: Do your computers games, business programs and other applications work OK? How Is Your Computer Performing? Is it loading up as expected, and is it running at least as quickly as when before patches were applied? How much time you spend on testing is entirely up to you. I usually check a couple of programs, web sites and maybe the printer. I also observe my computers performance on boot up, session activity and shutdown. I don't spend a lot of time testing. More often than not my own computer is fine after updates are applied. I suspect this is the same in your case too. Next we look at what you can do if a specific patch is causing you problems. If you test your computer and find any issues, the first thing to do is look at the Microsoft updates that have been applied to your computer. The files that are replaced on your computer are backed up automatically. To remove this security update, or any other update, follow these actions. Go to C:\Windows, then select the backup directory of the update you want to remove. A Microsoft XP Update backup directory always has the format: $NtUninstallKB#######$. The image below shows you the actual backup directory in this example. Click Next on the Software Update Removal Wizard screen. Before the problematic update is removed, you may be warned that some of your programs might not run properly. Click Yes to continue, but Only If You Are Sure! If you have any concerns contact your local computer repair company for advice and guidance. The update is removed from your computer, and the unpatched files are put back into your Operating System. Click Finish when prompted. I advise you to Restart Your Computer even though you may not be prompted to do so. Although this is now very much a legacy operating system, it is one of Microsoft's most successful. It's such a shame it is not secure in the way it is written, and the fact Microsoft are always eager to move everyone on to the latest platform. Still, I will look back on Windows XP with great fondness, as I'm sure you will too. Do You NOT Apply Windows Updates? Do you actively NOT apply Windows Updates? What problems, if any, has this caused you? Enter Your Title e.g. "New Updates Cause A Blue Screen"